Verdi began his Requiem Mass in 1869 as a contribution to a larger collection of tributes for the Messa per Rossini, to be performed on the anniversary of Rossini’s death. That project abandoned, Verdi expanded his portion (the Libera me) to the full scale of a Requiem in honor of the Italian writer and humanist Alessandro Manzoni, whom Verdi deeply admired. 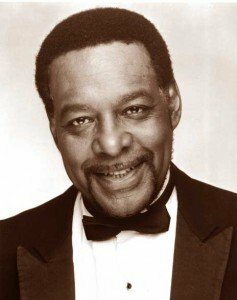 On Wednesday evening, the Boston Landmarks Orchestra, Back Bay Chorale, and One City Choir led by Christopher Wilkins and Scott Allen Jarret recast Verdi’s Mass as a memorial for the late bass-baritone Robert Honeysucker, who died in October 2017 [BMInt appreciation HERE]. He sang this work Landmarks in 2008 and appeared with the orchestra many times. Perhaps in homage to that earlier master the Requiem Verdi intended to honor, Wilkins opened with Rossini’s overture to Semiramide (1823). The opera relates the story of Semiramis, queen of Babylon, who negotiates the succession battles after the death of King Ninus. Written during the Italian Risorgimento, this story plays on the then all-too-familiar anxieties of decline and construction of empire; Rossini’s overture is a précis of the vibrant melodies that narrate the sprawling drama. Despite the urban distractions, Rossini’s vivid overture presaged a dramatic, dynamic ensemble for the remainder of the evening. In character, the Requiem contrasts starkly with Rossini’s sometimes flippant overture, though, early critics of the Mass also scowled at Verdi’s operatic tendencies in the liturgical work. Even in planning its premiere, Verdi toed the line between secular and liturgical by insisting female voices perform solo movements, [as did Rossini in his very late messa buffa, the Petite Messe Solenelle from his “Sins of Old Age”] ―a practice that technically excluded the work from Roman Catholic worship services until nearly a century after the composer’s death. [See “Sistine Chapel breaks 500-year gender taboo” HERE]. Verdi framed these dramatic moments in a dark, sometimes spare musical language: salvation and resurrection make appearances throughout, but exist in tense balance with despair. On Wednesday evening, Verdi functioned equally well in his broad, dramatic strokes as he did in miniature. The Back Bay Chorale (Scott Allen Jarrett, director) and One City Choir collaborated with the Landmark Orchestra. Wilkins’s reserved tempos seemed to aim at extracting drama in all its technicolor glory: if every performance is to be judged by the famous Dies Irae, Wednesday’s was an unqualified success, squeezing pathos from Verdi’s bombastic score. But add to this a majestic Rex tremendae and the groaning, full-throated Lacrimosa. Wilkins’s measured approach had the double effect of extracting inner details from the quieter moments of the mass fared well in his measured treatment: the opening chant-like choral melody shimmered over the esplanade; later, the staid octaves of the Agnus Dei marched with quiet dignity. 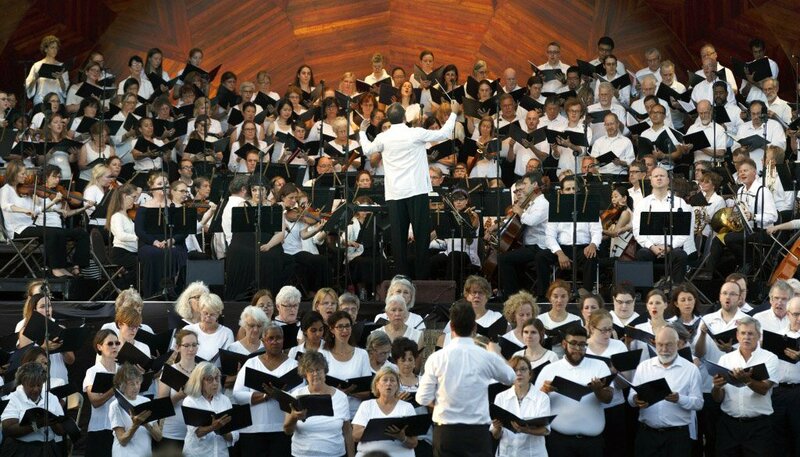 The choir, split between the back of the Hatch Shell and the fore-stage, should be commended on its discipline and preparation, negotiating Verdi’s harrowing counterpoint, at some points in eight parts, with full commitment and composure. Performing in small ensembles, the quartet of soloists shared Wilkin’s richly-imagined vision with sensitivity and poise, although soloists alone were less even. Tenor Yeghishe Manucharyan’s debonair sound was confident and full in the core of his range; at times, his upper reaches switched to a reedy falsetto. Baritone Nathan Stark gave an emotionally intelligent performance, able to switch from callous indifference to effusive warmth on the turn of a dime, yet the evening was sometimes marred by issues with support and tuning. Mezzo-soprano Ann McMahon Quintero and soprano Meredith Hansen were memorable both as soloists and in duet. Quintero’s warm, brazen lower range was a captivating thrill to hear from the lawn. Meredith Hansen was particularly memorable in the concluding Libera me shaping the frantic, sotto voce chants that open the movement with the same care and poise as the triumphant high c that glistened so cleanly in the movement’s climax. Wednesday’s outdoor setting couldn’t provide the nuanced sophistication that Wilkins may have extracted in an indoor venue, but the sweeping drama of the collaboration between Landmark Orchestra and choirs honored Honeysucker both with their music and their presence: indeed, as important as the performance’s fine musicality, the event reiterated the civic institutions that are at the core of arts and music in Boston. This was a program meant to serve the entire Boston community. On-stage, American Sign Language interpreters evoked the music for the hearing impaired; to the side, restless children took up batons and conducted along with Wilkins. 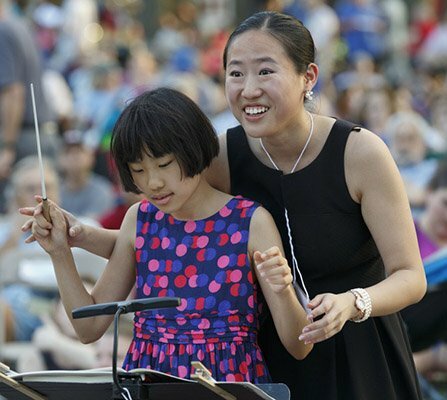 Audience members of all ages picnicked, enjoying the free concert in the sultry summer evening. Here is Boston at its most essential: couched on the Charles River Esplanade, the open-air venue features statues of great American musicians and military figures comfortably nestled in the living heart of the city. On one side, joggers ran along the river, while traffic on Storrow Drive wound around city on the other. Above, after menacing storm clouds cleared from the sky, the choir and orchestra was joined by low-flying flocks of honking geese. For some, the gallimaufry of noises, people, and activities may have distracted, but the mere possibility of convening a roster of professional and amateur Boston-based musicians to perform for an engaged audience testifies marvelously to Boston’s dedication to its public institutions and its thriving musical culture, and certainly it provided a great eulogy to Robert Honeysucker. I performed the Verdi Requiem last week. (soprano -front choir) I wish you had said more about the choir. It was extremely difficult to coordinate our voices. I think we did a wonderful job of blending and merging the 2 groups and eliciting beautiful tone. Scott Jarrett did a remarkable job of coordinating the 2 groups of singers with the conductor. His focus was amazing. He was totally in charge. He got the best out of the choir by his mastery of the music.